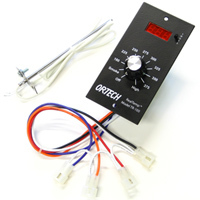 Ortech Controls is a leading provider of electronic controls. We design, develop, and manufacture controls for various applications including barbecues, pellet and biomass stoves, furnaces, and adjustable furniture. Our in-house engineering staff, with extensive electrical, software, mechanical design, and manufacturing experience, will work closely with you through the complete development process – from design and prototyping to production. Whether you are looking for an alternative supplier for a current controller, or need assistance with the development of a new product, please give us a call. We are best known for designing and building the original 3-speed and digital thermostat controls for Traeger Pellet Grills. available direct from the manufacturer. Contact Us directly, or visit our Amazon store. reference the RealTemp TR-100 User's Guide. Control issues? Let us help! © 2006 - Ortech Controls all rights reserved.